For Steinway and other makes. Knurled lock nut adjusts height. Rod is 1/4" in diameter. 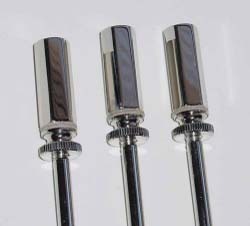 Set of 3 rods. Nickel-plated. Adjusts from 19-3/4" to 20-5/8".